All adult beginner classes in the winter session are now full--please watch for details on the next session to begin in mid-April. There are still openings for the childrens' classes on Saturday mornings and afternoons beginning on Jan. 9. If you are interested please click on the link to the registration form, or call Barb at 902-218-2493. Registration for the Winter 2015 Classes takes place online. This blog post should become visible automatically on December 28th, 9am. To fill in the online form with your information, please click on this class registration link. The form will be left open until all spaces in all classes are filled or January 4th, whichever comes first. 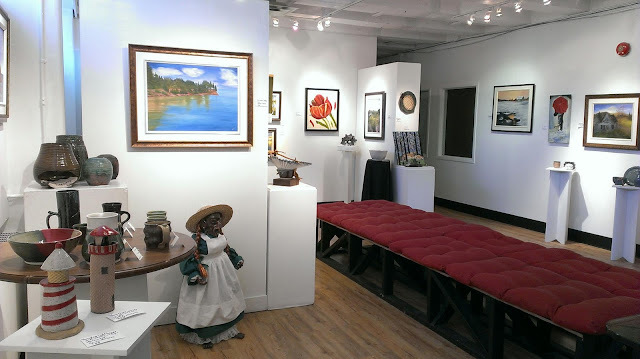 The Potters Studio is pleased that many of its co-op members are taking part in a joint art gallery show, in partnership with members from Lysette Sampson's painting group, @ The Guild in downtown Charlottetown. Show pen from noon to 5pm Tuesday-Saturday from noon to 5pm. 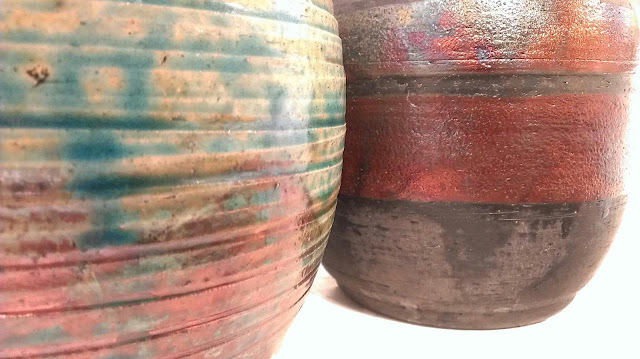 Registration for the fall session of pottery classes is full as of Sept 7, 2015. If you have questions please call Barb at 902-368-3268. The hugely popular annual fundraising pottery sale for the PEI Potters Studio will be held on Saturday, August 22 from 9 am to noon(ish) at the Confederation Court Mall (first floor near Shopper's Drug Mart) in Charlottetown. Work by studio members and students, as well as professional Island potters, will be available at great prices! Come early to be sure to get the best selection! Funds raised from the sale will help the studio provide opportunities for children and adults to learn about and enjoy working with clay. For more information call Barb at 902-368-3268. Fall 2015 Session online registration form opened after Sept. 1, 6pm and stays open till to Sept. 11, 6pm. Note that payment is through Interact online email money transfer. If you have problems with the online form or the payment process, please contact Barb at 902-368-3268. The spring session of classes starts this week and all of the adult and childrens' classes are now full. The next session will begin around the third week of September. If you are interested, please check back in August for further details, or call Barb at 902-368-3268. Spring pottery class registration opens Mon April 6 at 6pm and runs to April 10th or until all spaces filled. Note that the form below will be closed to new entries once all spots filled. Link to online registration form: Please click here. Due to requests from students and issues with previous registrations, we're going to pilot an online system for registration for the spring 2015 pottery classes. This will open Mon evening April 6th (after 6pm) and remain open until April 10th or until all spots are filled. There will be on online registration form (linked on this blog on Wednesday) and payment will be accepted through an Interact email money transfer. Alternate arrangements can be made if the Interact email money transfer is not possible. The spring session has been greatly affected by the recent series of snowstorms and roads to the studio being closed for long periods. Adjustments are being made for the Monday and Tuesday students (most affected) and the term has been extended for the Thursday to Saturday students. Due to the class adjustments, no spring 2015 class is available on Monday evenings and the new session will start and end later than earlier years. If there is enough extra demand for an additional class, we will try to arrange for another instructor and a class either Friday or Saturday evening. The spring session of pottery classes at the PEI Potters Studio in Victoria Park will begin the week of April 20 and run for a 10 week period. Classes are available for adult beginners on Tuesdays or Thursdays from 6:30 to 9:30 pm. Depending on interest a beginners class may also be held on Monday evenings starting April 27. Classes for children ages 9 to 14 will be held on Saturdays from 10:30 to 12:30 or 1:30 to 3:30 beginning April 25. Please note that registration is first come first serve except for spaces that have been reserved for returning students and gift certificate recipients. To register and for more information, please call Barb at 902-368-3268 by April 10. All of our adult classes are now full for the winter session but we are investigating the possibility of holding an additional class on Friday evenings. There are still openings for children ages 9 to 14 in the Saturday morning and afternoon classes beginning Jan. 17. Our next session will begin in mid-April. For more information, please call Barb at 902-368-3268.